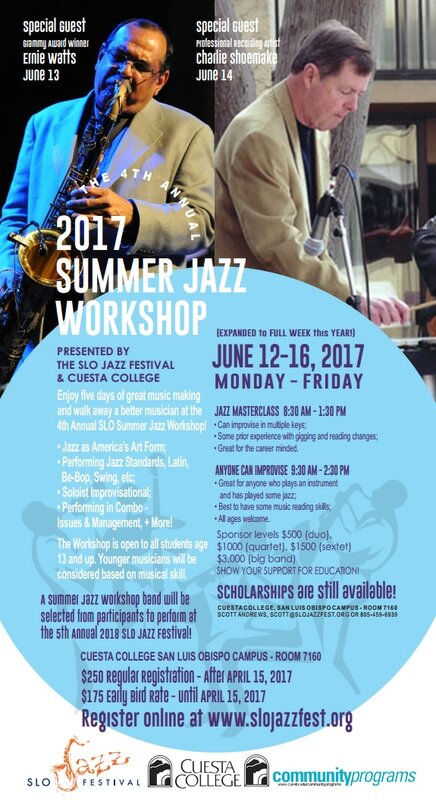 The 4th Annual Summer Jazz Workshop was held June 12 - 16, 2017 at Cuesta College. 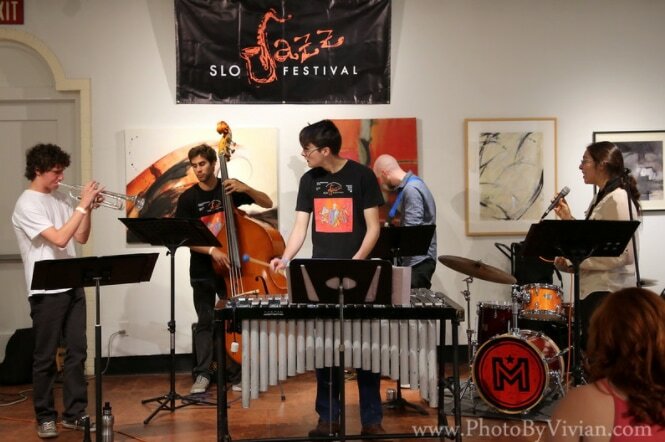 The SLO Summer Jazz Workshop is now a 5-day performance course aimed at students from Junior High through College. Each instrument in typical jazz ensembles will be represented by a professional musician fluent in that instrument. Each student will be instructed as to the role his/her instrument plays in a jazz ensemble. Students will also be instructed in the importance of competence on their instrument as well as how to dress and come across on the band stand. Stage presence and team spirit will also be covered as well as how to acquire club dates and how to charge for a performance. In other words students will be taught how to earn money as a musician if that’s what the student so chooses. On June 14, we will also feature recording artist Charlie Shoemake, who is an American jazz vibraphonist of the finest quality, and pianist as well. Shoemake played in George Shearing's Quintet for seven years from 1967 - 1974. He also played vibes on the soundtrack for Clint Eastwood's film Bird. Charlie is well-known to Cuesta students as the Director of the Central Coast Jazz Institute. "Arguably the most successful teacher of jazz improvisation in Southern California history, Shoemake is also a highly charged mallet man capable of blistering solos off the metronome markings…" - Leonard Feather. Learn more at: www.talsanmusic.com. $250 Regular Registration (starting April 15, 2017). Through a joint partnership between SLO Jazz Festival and Cuesta College Community Programs, with Direction from Ron McCarley, Director of Jazz Studies, we are announcing the 4th Annual Summer Jazz Workshop registration next week. Registration is open and fee $250. Big Band sponsor of the Summer Jazz Workshop, an education event held June 12 - 16, 2017. Receive significant print, and banner behind the band benefits and ad in program. Includes 8 complimentary concert tickets.